We take enormous pride in our PreForm software, which is re-inventing what desktop 3D printing software can do. PreForm 0.9.0 (download) is one of our most significant updates yet. For PreForm 0.9.0, we’ve rewritten our support generator from the ground up. The support generator performs a high-speed analysis of your models and automatically generates support structures that will help ensure that your prints come out the way you want them to &ndash; regardless of part complexity. 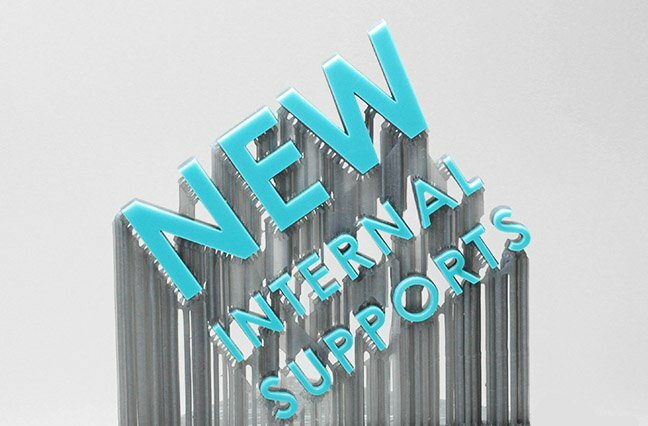 Our new support generator allows PreForm to automatically generate internal supports. There’s no need to worry about overhangs, lips, or multi-body models like the example above. PreForm will build a support system into under-supported areas in your model, no matter where they are: this makes complex designs and features a snap. Coupled with PreForm’s auto-orient feature, preparing your model for printing is fast and easy. With internal supports, this part is fully supported and ready to print! We’ve also overhauled the geometric structures behind our automatically-generated supports. Our new system uses more, smaller touch points. These touch points effectively support your model and peel away easily, leaving a smoother surface finish. The support generator also makes for some wild geometries and structures all on its own. In addition to those big changes, we’ve made a range of interface improvements. From overhauling all of our dialogues to tweaking our slice viewer, we’re paying attention to all of the little details. We’ve also improved the material-selection workflow, making it easier for you to pick your resin and layer thickness. We’ve changed the way PreForm loads models, which means that your large, elaborate designs will load more quickly. That’s super-handy if you’re working with a couple million vertices. We’ve also taken a pass through our automatic repair system, ensuring that it’ll do the right thing, every time. Come check out the latest software&ndash;as well as some of our latest models that show what can be done with PreForm 0.9.0&ndash; at World MakerFaire New York City this weekend!